Under the guidelines published by the Center for Disease Control, known as the CDC, the same universal precaution procedures are followed for all patients as each one is considered a possible carrier of an infection. The precaution techniques are used minimize the possibility of an infectious condition being transmitted to a health care worker. Possible infections include HIV and Hepatitis B, as well as other pathogens. 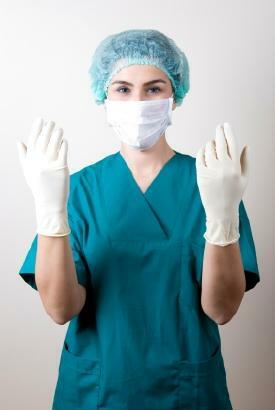 All medical personnel in hospitals, nursing homes and medical laboratories follow the techniques and safety measures that make up the universal precaution guidelines. They are also in place in certain situations involving childcare settings, schools and industrial settings. These precautionary techniques of universal precautions are the result of the outbreak of AIDS, or acquired immunodeficiency syndrome, that took place in the 1980s. In the summer of 1987, following the news that three workers from a clinical laboratory were infected with HIV, the universal precautions, or UP, were put into effect. This was followed in 1991 by the publication of universal standards of health and safety by the Occupational Safety and Heath Administration, or OSHA. The regulations and procedures are updated as often as the CDC and OSHA feel necessary to further safeguard health field and laboratory workers. In 1996, the Center for Disease Control updated the guidelines to include standard precautions, mostly for use in hospitals, to include isolation precautions. What bodily fluids are included under Universal Precaution Measures? Universal precaution procedures include the following bodily fluids and tissues from the included areas. Not all bodily fluids are included under universal precaution measures. The following are those that are not included. Precautions and techniques that help ensure the safety of health care workers from the transmission of infectious conditions include barrier precautions, hand washing and the careful handling and disposal of sharp medical instruments. The use of protective barriers is a very important aspect of universal precautions. These barriers, called personal protective equipment, include wearing the following items. Wearing these items protects the workers and reduces their risk to possible exposure of their skin and mucus membranes from infectious conditions. Universal precautions also instruct individuals to wash their hands immediately after removing their gloves. Hand washing is a very effective technique for preventing the spread of infections. Proper handling and disposal of sharp medical instruments that can transmit infection to a health care worker are outlined in the universal procedures measures. Hypodermic needles and scalpels are two of the items that pose the most danger. Careful handling and cleaning of medical instruments and disposal of needles in a special puncture resistant containers are essential. While all health care workers need to follow universal precautions for their own safety, pregnant workers need to be extra careful. It is known that they stand a greater risk of contracting an HIV infection then workers that are not pregnant. If this occurs the baby is at risk of developing the infection through perinatal transmission. Following universal precautions for health and safety are steps that minimize the risk of becoming exposed to infectious conditions.